I’m an apprentice at BAE Systems’ Portsmouth naval base site. I’m currently on my first six-month placement and I think that I would like to work as a mechanical engineer on lots of different ships when I complete my apprenticeship, although I still have a couple of years left to decide. I changed my mind about going to college at the very last minute and decided to go for an apprenticeship after realising that it offered me a chance to develop some of the skills I knew I already had. A family friend who knew BAE Systems well helped me find all the information I needed about the apprenticeship scheme, and after looking into it more thoroughly I decided to apply. I’ve always been a very hands-on person, so I love learning how things fit together and work, how we can improve them and make them more efficient. I grew up around boats, sailing every summer and helping my grandad to fix and mend them. Working at the Portsmouth dockyard is basically a dream come true! I’m one of the youngest on the scheme and it is sometimes hard when I know that my friends have all finished college for the day and I’m still working! The apprenticeship is hard work, but I know that I have made the right decision. I’m surrounded by great people at work that help me learn and grow and I’m excited by the guarantee of a job at the end of it. First of all, I would wholeheartedly recommend the scheme to anyone who is interested – it’s amazing to have the chance to be involved in real projects that affect real people. 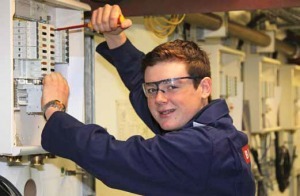 All the information you need about BAE Systems’ apprenticeship scheme is available online at baesystems.com/careers. It’s also useful to talk to people who have completed apprenticeships themselves so that you can find out which area you might be best suited to.